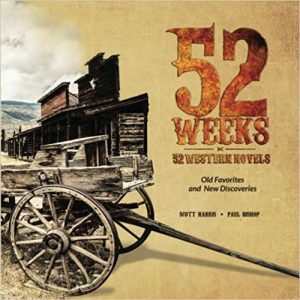 52 WEEKS & 52 WESTERN NOVELS edited by Scott Harris & Paul Bishop. First, I have to admit a bias. The coauthor of this book, Paul Bishop, is an old friend of mine and many of the authors profiled, and the contributors who wrote about them, are my friends, too. Also one of the books covered, OUTRAGE AT BLANCO, is published by Brash Books, a company I co-founded. All that said, I love this book and I believe I would even if I didn’t know so many of the people involved. If I were really industrious, I’d list 52 reasons why this slick, beautifully designed book is a must-have for western fans…especially those who are just getting into the genre. #1 on my list would be that it offers a great overview of key western novels that offer a wide-ranging perspective on the genre. #2 would be that each entry is affectionately, and knowledgeably written by either well-read experts in the genre or acclaimed western authors. #3 would be that even long-time western fans will learn some interesting facts about books and authors they thought they knew everything about. Count me among them. This book is packed with information and will make you want to read, or re-read, every single title. It’s not clear to me how the 52 books that are covered were chosen…or why some authors get two or more listings (like Claire Huffaker, Marvin Albert and Louis L’Amour) while other landmark authors/novels aren’t listed at all (like Larry McMurtry’s LONESOME DOVE and A.B. Guthrie‘s THE WAY WEST, for example). There are lots of well-known titles (especially among western fans) and many obscure ones that were new to me (and that I am eager to read!). If I have a criticism, it’s that the write-ups can be a bit too familiar at times, with the contributors talking too much about themselves or about how they know the authors (“I’ve had the great pleasure to get to know Arnold and his wife Bonnie over the years” or “Bill and I first met through the pages of fanzines” etc). I also wish the two editors had resisted the urge to refer to their own western novels (“In my own series of western books…”) in write-ups of other books or to have their books included in the listings — it gives the book an unnecessary, self-promotional aspect that detracts from the overall professionalism of the endeavour. But those are minor quibbles. The passion the editors and their contributors have for the genre, and for these books, is palpable. This isn’t a dry, stodgy reference work. It’s a fun read, written in a casual, energetic style that makes you feel like you’re having dinner with a group of really smart, really passionate western fans who can’t stop talking about the books they love…and that they want you to love as much as they do.